Earlier this week, I attended a farewell party hosted by Ambassador Michael Michalak in honor of Jim Warren, the U.S. Embassy’s Public Affairs Officer (PAO) for the last few years. The Ambassador accurately described it as a “bittersweet” event. He noted that it was Jim, also new at the time, who organized his first trip as U.S. 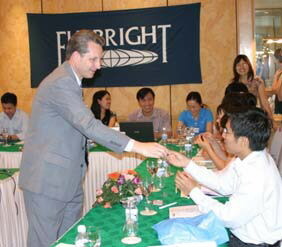 Ambassador to Vietnam to a 15th anniversary workshop for Fulbright in Hue, which I also attended back in August 2007. It was also Jim and his staff who were instrumental in organizing three consecutive and successful education conferences that brought together Americans and Vietnamese to talk about higher education exchange between their two countries, learn from each other and network. Jim is on his way to Karachi, Pakistan, where he will be the Senior Adviser for Public Diplomacy in the U.S. Consulate General there. Those of us of worked with Jim to promote U.S.-Vietnam educational exchange will miss him and wish him and his wife all the best as they begin the next chapter of their lives and one of ultimate professional challenges for a U.S. diplomat specializing in public diplomacy. We look forward to welcoming them back to Vietnam someday!